SEOUL, April 10 (Yonhap) -- History shows that when politics meets football, something bad happens. South Korea's Gyeongnam FC recently learned that lesson the hard way, even though they weren't the main actors in the story. Gyeongnam, last year's runners-up in the top-tier K League 1, were penalized by the nation's pro football league operator last Tuesday after they failed to stop a political party from campaigning inside their home stadium. Gyeongnam were slapped with a fine of 20 million won (US$17,590) by the K League disciplinary committee for not responding properly when members of the main opposition Liberty Korea Party (LKP), including chairman Hwang Kyo-ahn and by-election candidate Kang Ki-youn, campaigned inside Changwon Football Center in Changwon, 400 kilometers south of Seoul. 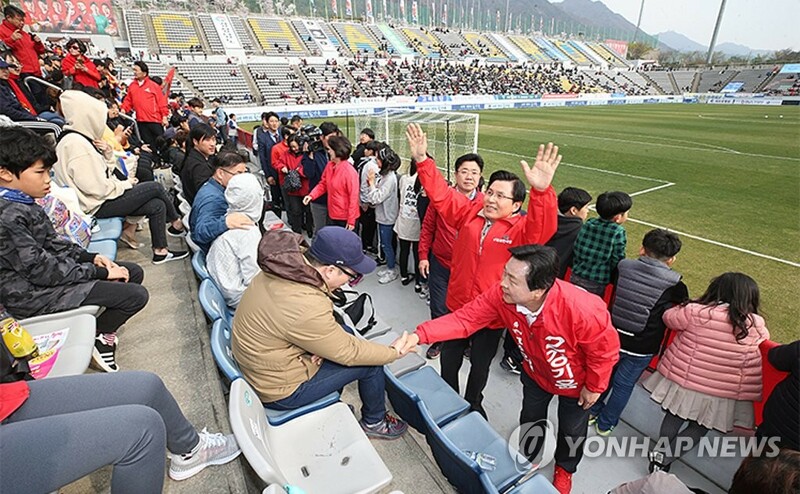 They were there on March 30 during a K League 1 match against Daegu FC, four days before the by-elections. It was the first time in the K League's 36-year history that a club was penalized for an incident involving political activities. "This is a very rare case," Hahn June-hea, a football analyst for local broadcaster KBS, said. "We've seen clubs getting punished over their players or fans' actions inside the stadium, such as players making politically sensitive goal celebrations or signs, and fans displaying banners with political messages, but I've never seen or heard of this kind of incident." The league's code of conduct stipulates that its members must maintain political neutrality, which is in line with FIFA, Asian Football Confederation (AFC) and Korea Football Association ordinances that strictly ban any kind of political, religious and racial activities inside match venues. The violation of such rules can result in a team getting slapped with a 10-point deduction, having to play a home match behind closed doors or receiving a fine of 20 million won or more. For Gyeongnam, the situation seems somewhat unfair and beyond their control, after stubborn politicians intruded on their home ground. According to the club, they did their best to stop the improper campaigning, but they were outnumbered by the LKP members who apparently only cared about winning votes. "Our security staff told Hwang and Kang's camp members that they could not enter the stadium with outfits bearing the party's name, the candidate's number and name," the club said in a statement. "But some officials shoved their way into the stadium, ignoring ticket inspectors, and they didn't take off their jackets." Under K League rules, election candidates and party officials can enter the stadium after purchasing a ticket at their own expense. But they cannot wear any clothing displaying a candidate's number or name, their party name or emblem inside the stadium. The rules also prohibit them from distributing pamphlets or cards containing political messages and from displaying slogans and banners. The K League discipline committee said it considered Gyeongnam's efforts to stop the LKP campaigning, but still, rules were rules. 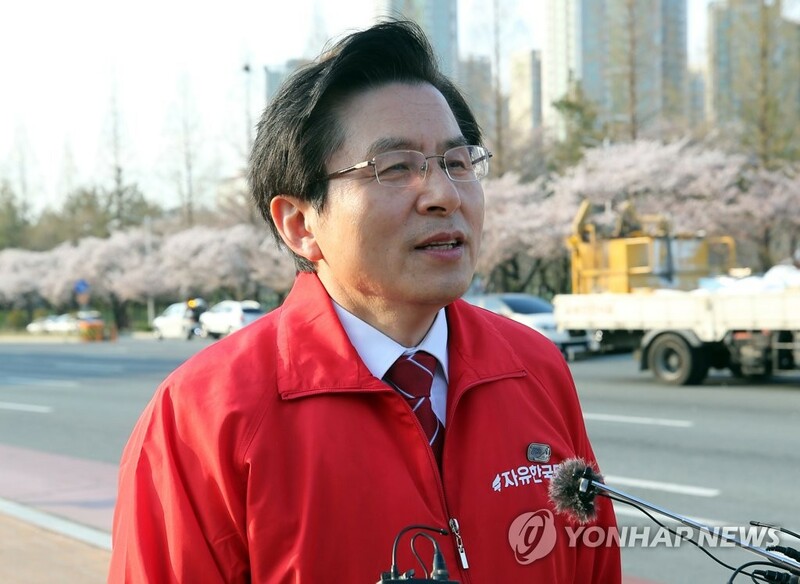 "Based on video footage and witness statements, we confirmed that Gyeongnam actively tried to stop the campaigning inside the stadium," Kim Jin-hyung, the K League's public affairs team director, said. "But such an incident was a clear violation of our code of conduct ... Gyeongnam could have prevented the incident by hiring more security staff, since the by-election atmosphere in the region was heating up." What concerned fans the most was whether the incident would affect Gyeongnam players and team performance. Head coach Kim Jong-boo did admit that his side was shaken up by the off-pitch incident. However, they showed their grit by overcoming a three-goal deficit to manage a 3-3 draw with defending K League 1 champions Jeonbuk Hyundai Motors at home on April 2. "It's fortunate that we avoided point-deduction penalty," Kim told reporters after the match. "I just told players to focus on the game." Now, all eyes are on whether Gyeongnam will file a damages suit to force the LKP compensate them for their financial losses. The K League said Wednesday that Gyeongnam have paid a 20 million-won fine and submitted their appeal against the league's penalty. The K League will hold a board meeting on April 18 to review Gyeongnam's appeal and decide whether to uphold the original decision by the discipline committee. Following the K League discipline committee's ruling last week, Gyeongnam demanded an apology from the LKP and warned the conservative party that they may take legal steps if "proper measures" are not taken. "We're currently reviewing the possibility," Kim Ji-hoon, who works at Gyeongnam's public affairs team, said. "At this point, I can't say that we will certainly lodge a suit against the LKP. We'll soon make our decision." Gyeongnam are run by the municipal government of South Gyeongsang Province and taxpayer money is one of their revenue sources. Since it seems unfair for Gyeongnam to cover the damage at their own expense, football fans have been urging the LKP or its chairman, Hwang, to pay the fine. The LKP apologized to Gyeongnam fans and residents in South Gyeongsang Province after the incident took place, saying it also wants the K League to reconsider its decision. However, the main opposition party was reluctant to pay the fine for Gyeongnam, saying such an activity could be a violation of the election law, which prohibits politicians or related groups from giving financial benefits to others. Legal experts said it's possible for Gyeongnam to lodge a civil suit against the LKP to get their 20 million won back, but that would be no easy task. 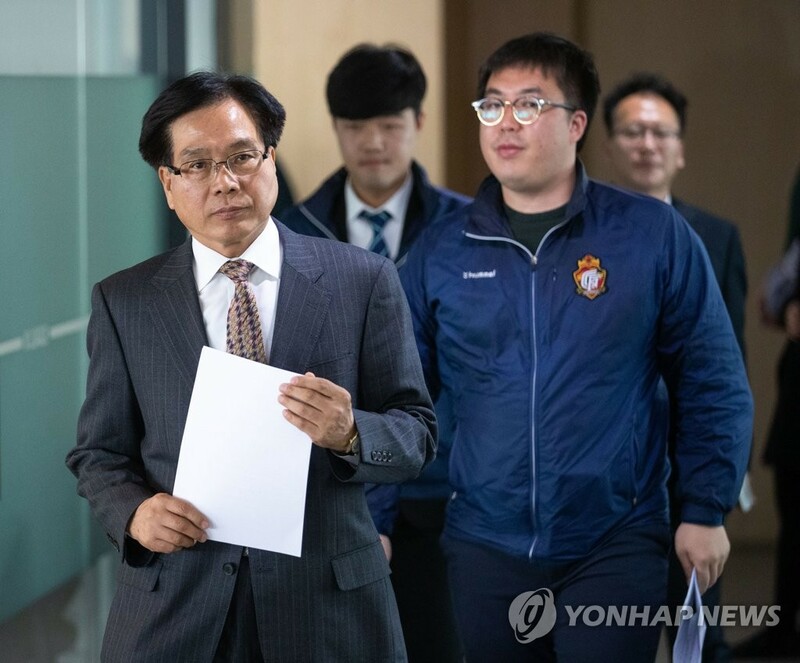 "The K League ruling showed that Gyeongnam could have done better work," said Park Ji-hoon, a lawyer who has represented various clients in sports industry, including the football players' association. "If the case actually goes to the court, many things will be disputed." For their improper campaigning inside the stadium, the LKP only received an administrative disposition from the election commission of South Gyeongsang Province, which just asked the party to cooperate in making the election clean and fair, since there was no law punishing a political party for committing such misconduct. The LKP may have already paid a price for drawing football fans' ire, as Kang lost the parliamentary by-election to Yeo Young-guk of the Justice Party in Changwon. No one knows how much of a role the incident played in the by-election in Changwon, but regardless, those in the football community said the incident should serve as a good lesson for politicians. "This case shows that politicians have been thinking about sports," Hahn from KBS said. "Whether they are conservative or progressive, I just hope politicians pay more attention to the culture and rules of sports." (LEAD) N. Korea replaces top official involved in negotiations with U.S.
N. Korea blasts S. Korea for holding joint military drill with U.S. Copyright (c) Yonhap News Agency. All Rights Reserved. Enter your feedback here. To help protect your privacy, don't include personal information, like your name or address.